"Talking of thrills, the professor assuredly gets his. He is thrilled through and through. He is gagged and then he is thrown into a mummy's coffin and humiliated to a great degree. But in the end he turns the tables and lands his enemy in durance vile - on a charge that was originally brought against the professor himself!" "Professor Gregg arrived in New York on a liner at a time when news was very light, which explains why the reporters gave big displays to the fact that Gregg was returning with rare antique jewels which he had unearthed abroad. He also had a vast collection of other antiques, and the value of his belongings was set at an enormous figure. The accounts were read with great interest by a number of persons, including a gentleman whose fingerprints and photograph were highly treasured by the police of many cities. It struck him that the professor was far too wealthy, and he determined to see if they could not do business together. So he evolved a neat little plan whereby he hoped to meet the professor and the jewels. The professor received word that a mummy was to be sent to him for inspection, and hoped that he would buy it. He arrived on scheduled time, but he did not have much time to inspect it. For the mummy, who was the before-mentioned light-fingered individual, climbed out of his case, swatted the professor, and, assisted by the expressman, bound and gagged him, then interred him in the case and sent him away. "The professor spent a few unhappy hours a prisoner in a dirty room, then he managed to free himself, and started back toward his hotel. On the way he met a newsboy, and hearing him cry out, 'All About the Smuggler,' he bought a paper. It interested him to read that Professor Gregg had been captured in his hotel room on a charge of bringing in valuables without notifying the customs authorities. His admiration of speedy metropolitan justice was intensified on learning that his substitute had been arrested, tried and convicted within two hours, and was already beginning to enjoy a six-month sentence. That the prisoner refused to tell the police where the gems were hidden also pleased the professor. The substitute was mutely brooding in his cell. He had been afraid to tell the police he was not the professor, for if he proved it he would convict himself of burglary, which meant a long sentence up the river. Still, although he had saved time for himself, he was far from being cheerful. Then a message arrived from the outer world. It was from Professor Gregg. He explained that he had sold all his antiques before the substitute arrived, and he thanked the latter warmly for representing him at the role call of the city prison. The substitute thought of the professor, who had told him he was now on the ocean, heading for a pleasure trip in Europe. The substitute was a strong, course man, but he wept. Then he removed his false white whiskers, part of the disguise the police had not penetrated, and cursed." Note: The phrase, "up the river," in the preceding synopsis refers to Sing Sing, the state prison at Ossining, New York, up the Hudson River from New York City. "Unfortunately the play permits a rascal to escape his just dues and to leave the country. Were not the story one of decided originality in theme as well as in the treatment, this fact would lay it open to censure, but this quality and serio-comic vein warrants the pardoning of its climax. A 'professor' arrives in New York from abroad, the newspapers relating of the vast treasure he is bringing with him in the way of antiques and ancient historical relics as well as jewels. A pair of crooks read of his arrival and plan to ensnare him and steal the treasures. They prepare the shell of a mummy and write the 'professor' at his hotel of their great discovery, asking the privilege of sending it to him, that he may inspect it. Meantime one of the pair makes himself up to resemble their anticipated host and secretes himself in the shell, which is then conveyed to the hotel. The expressmen are confederates of the crooks and at once seize the 'professor,' bind and gag him and put him in the box, the other stepping out. The box is taken back to their den, where the prisoner is left in supposed security. The impersonator then rummages through the hotel apartment in search of the supposed hidden riches. As he is at work detectives enter, arrest him as the 'professor,' and take him to prison on a charge of smuggling. 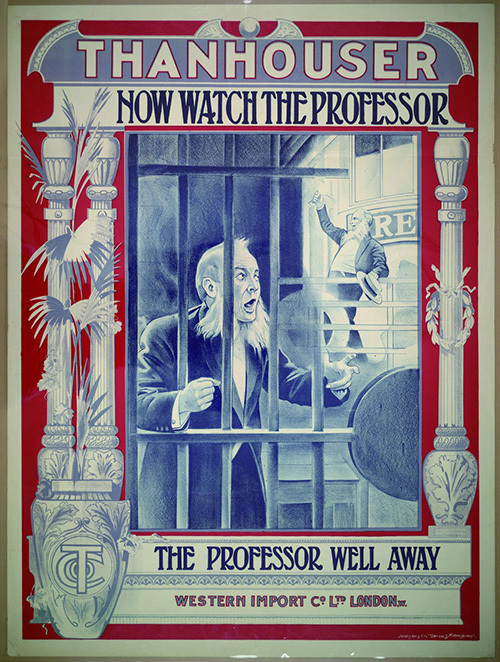 The real 'professor' frees himself, escapes from the den, reads the account of his own supposed arrest, hies to a steamship pier, boards an outgoing vessel and then sends a parting note to the crook at the prison, congratulating him on his successful attempt, addressing the note to 'Prof. Gregg,' his own name. The last seen of the old rascal is when he is standing on the deck of the steamer waving a laughing farewell, the joke being doubly amusing because of his note, which informed the crook that he had sold all of his smuggled goods immediately on landing. It is thoroughly entertaining in the way it is staged, the scenes being finely put on and the acting being of a creditable standard." "An excellent comedy-drama which grips the interest of the audience from start to finish." "Riley Chamberlin as Professor Gregg 'put one over' on a very wise young man who thought he was also slick. It is good comedy - and a little out of the ordinary, in fact, novel."